Workpieces are “worthpieces”. With building components for the technical industry, it comes down to maximum quality and safety. This applies in particular to complex production processes – from the workpiece right through to the precise component and finished part. 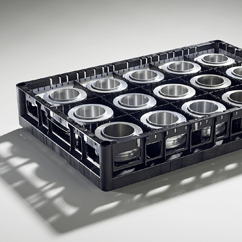 The FRIES tech-rack system ensures efficiency and ease of use at every stage of the process: Optimum cleaning results, maximum protection for sensitive surfaces, secure transportation and a perfect storage solution. Depending on the application, the industrial rack is available in material versions polypropylene (PP) and glass reinforced polyamide (PAG).